Well you could blow your hard earned dosh on a lot worse. The 40 Irvin should fit you a lot better and be a lot more comfortable to wear Art, plus room for a jumper underneath which never hurts. Irvins just don't look right when they're fitted, they need to be a bit on the bigger side to look right. Thank you very much indeed Art! I asked the people at Aero which combination of leather/knits colour would be closest to the originals of this contract, and they told me it would be this combo. nkang, seres, kowalski and 12 others like this. Good looking jacket Thomas ! I didn’t know that Bronson made a waist coat . Would you show us the mail bag? I didn’t know Bronson made one of those as well. I’m with you Art , a bigger jacket would look better. Great looking Aero and you definitely nailed the fit down pretty well . Pilot, Nickb123 and geoff.adams.96 like this. Pilot, blackrat2, Nickb123 and 2 others like this. Just wow, very nice looking jacket. Pilot and Nickb123 like this. 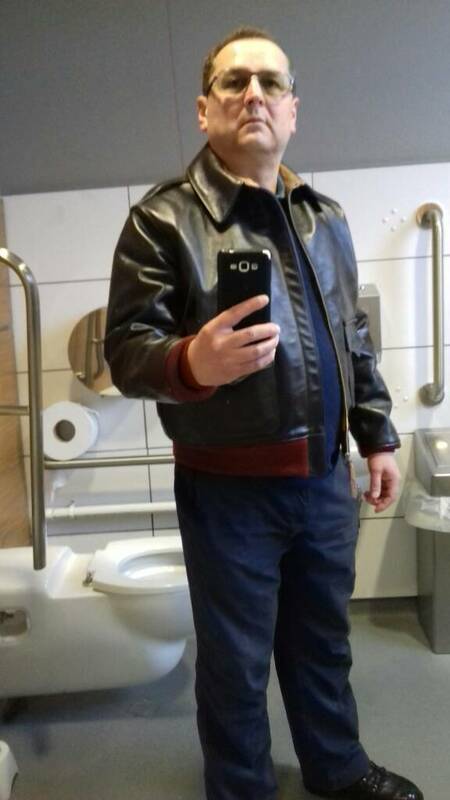 Good jacket and good fit Geoff, do not be confused by the sleeves lenght, everything will be OK. Well done, that made a photos and it is good that you are not embarrassed by the background, it is secondary, the main thing is that the jacket is good. Lovely Aero that is. These jackets are so underrated IMHO. Is there a detailed review anywhere? I must have a look. 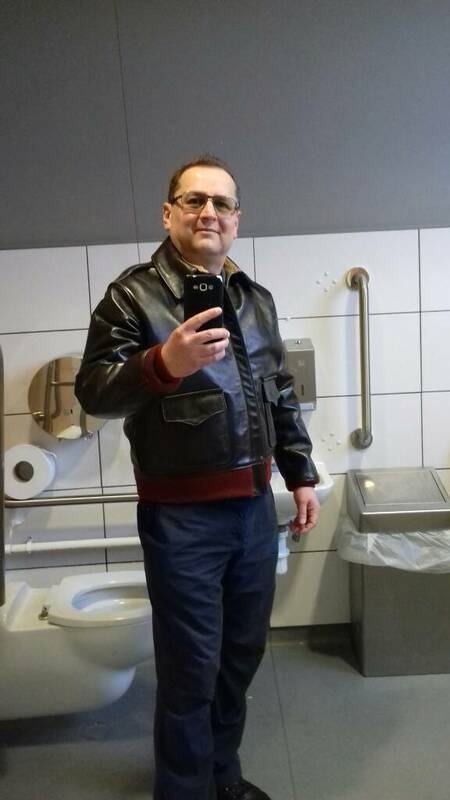 Nickb123, geoff.adams.96 and Pilot like this. That's very kind Nick, but I think you are being far too generous - your jacket is absolutely stunning. In the future I would like to have a russet brown A2, and when I do yours will basically be it, and yes, I'll buy an Aero again for all the obvious reasons. kowalski, Thomas Koehle, Boyo and 4 others like this. Not yet. Was purchased from a gent on TFL. I agree with you. This one's kind of a laugh because it's actually seal Vicenza hh but appears more russet! The trick to this one was that the previous owner wore it; the leather really looks swell broken in. I gather these are rust knits? Reddish brown, but not quite a red. Or berry? Nice photo..... nice sunburn......nice car... in a great spot in France no less! Pilot and Earloffunk like this. Rust knits controversial? Well yea on the B10 I recal but nah, not if you like ,'em and I do hence to repeat myself from other posts, if I do ever go for another A2 it would be Seal/rust combo, gutted I missed out on a lovely one a few years back on GW's sale page! 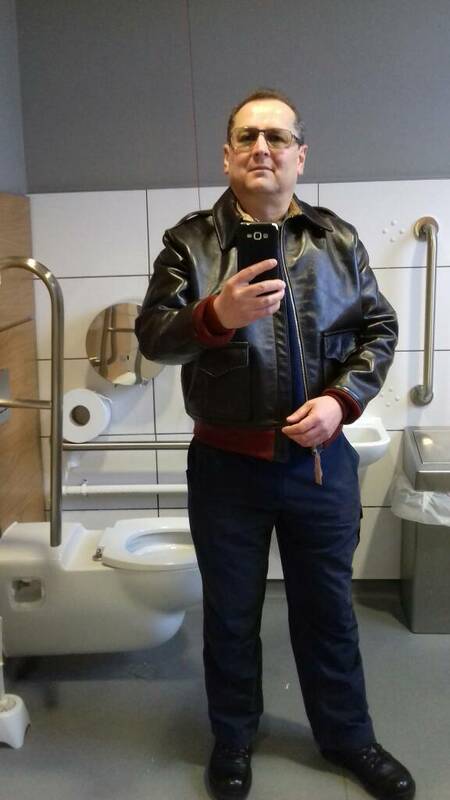 In future too I must steer clear of strange men in M&S loo's taking pictures of themselves - unless maybe he's wearing an A2 and I'm wearing mine!! 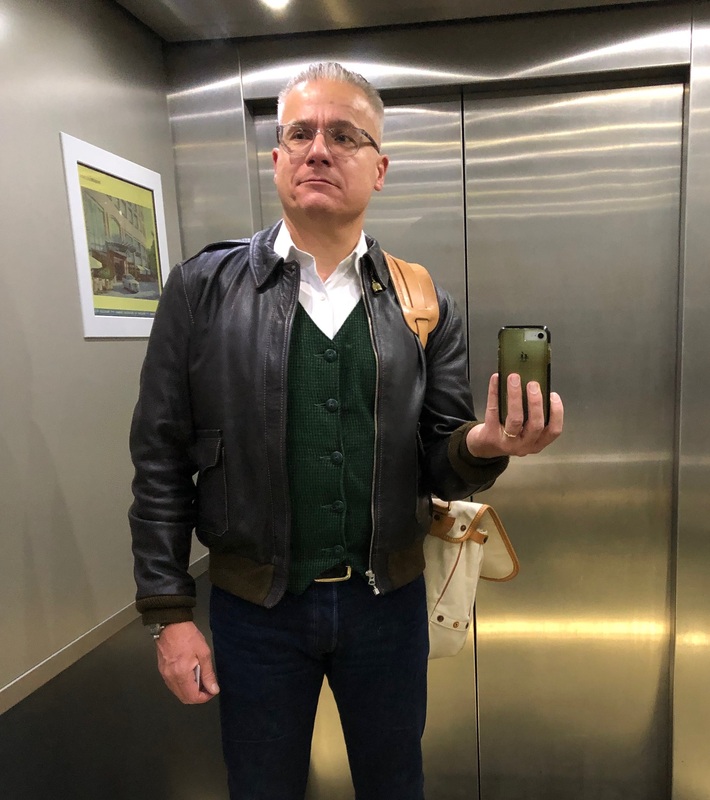 I've said before, given how popular our jackets are and living in London, I've rarely bumped into someone else wearing one, maybe just a handful of occasions! geoff.adams.96, Pilot and B-Man2 like this. Hahaha...good one JW .. 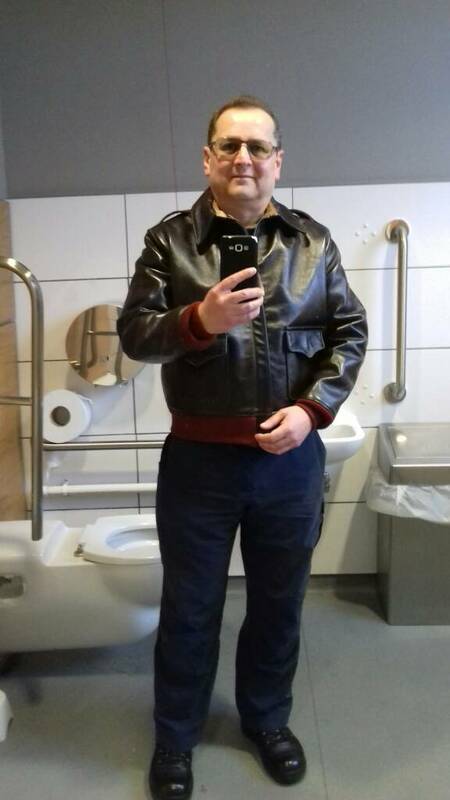 I bet running into another chap wearing an A2 in the loo is a real ice breaker .